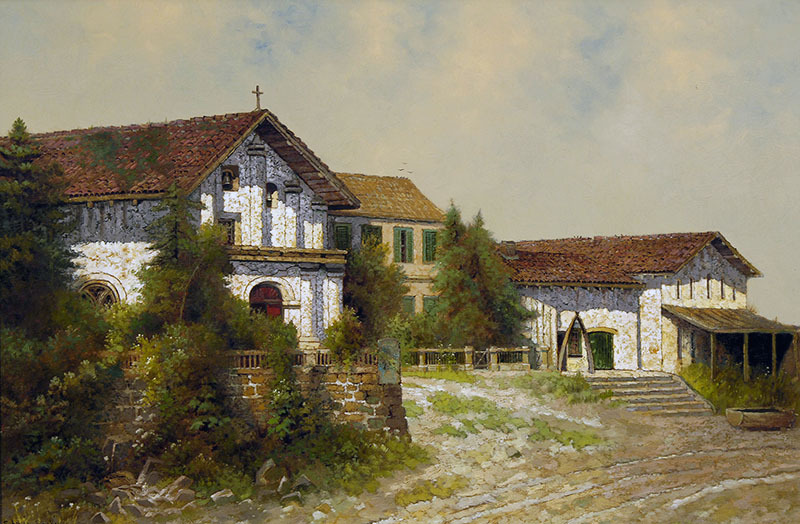 Mission San Francisco de Asís. Courtesy of Santa Barbara Mission Archive-Library. The evolution of California is quite evident at Mission San Francisco de Asís. Located in the downtown mission district of San Francisco, this mission was founded on June 29th, 1776 by Father Serra, just five days before the Declaration of Independence was signed on the other side of what would become the United States of America. It was founded 6th in the mission chain. Officially named after Saint Francis of Assisi, founder of the Franciscan Order, the mission seems overwhelmed by the burgeoning city of San Francisco and dwarfed by its neighbor, Mission Dolores Basilica, built 100 years after the mission in 1876. San Francisco de Asís is often called Mission Dolores, due to its close proximity to a nearby creek named Arroyo de los Dolores. Having survived the great earthquake and fire of 1906, the mission church is the oldest intact building in the city of San Francisco and the only intact Mission Chapel in the chain of twenty-one established under the direction of Father Serra. The mission’s simple exterior belies its sophisticated and detailed interior, enhanced by the magnificent ceiling painted by the Indians with vegetable-based paint. The church altar at Mission Dolores features several statues of the saints for whom the missions were named. This stunning and richly decorated interior is one of the most striking in the mission chain. The cemetery of Mission Dolores contains remnants of mission history, including a statue of Father Serra. The mission was plagued by disease and high mortality rates among the Indian population. In fact, by 1832, more than 5,000 Indians had died at the mission. Some blame the high death rate on the inclement weather of the San Francisco Bay, and on European diseases, such as smallpox and measles, for which the Indians had no immunity. Concerned fathers discussed moving the mission across the San Francisco Bay to the north, to provide a healthier environment for the Indians. However, the relocation never took place. From Marin County: Take the Lombard Street exit off the Golden Gate Bridge. Turn right onto Van Ness. Right onto Market Street. Left on Dolores. Proceed to 16th Street. From the East Bay: Take the Bay Bridge to US-101 north. Exit at Duboce Avenue/Mission Street. Left on Guerro. At 16th turn right and proceed to Dolores. From the South Bay: From CA-280 north, exit at San Jose Avenue. At the "Y" take Dolores to the left. Proceed to 16th Street. and limited hours on Good Friday (9a - 12p) and Easter Sunday (10a - 1p). Please call 415-621-8203 to confirm. Docent led tours for groups of ten or more, reservations required. Call 415-621-8203 for further information. A 40-minute audio tour (English) is available.